I preach this to our clients all the time: “Don’t forget to be social on your social networks.” It is the biggest problem I see with business pages on all platforms but specifically on Facebook. There is this idea that if we are going to have a Facebook Business Page, we must use it strictly for business. This is the biggest mistake you can make (next to not posting almost everyday) if you have a Facebook Business Page. Why be on a Social Network at all? Business owners forget this quite frequently. They forget that being social is how people will decide IF they even want to buy your products or services. To this end, Facebook recently made a change that has thrilled me since I have been doing this for our clients consistently. 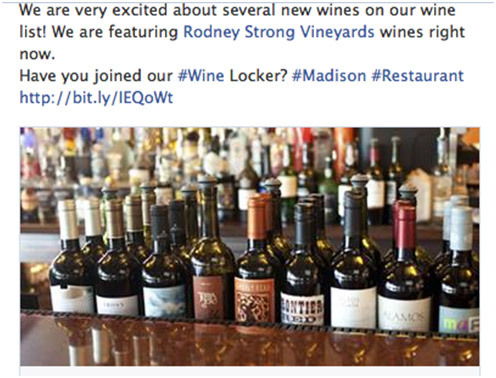 In the example, I tagged Rodney Strong Vineyards, it turned blue and now, the owners of that page see it and so do many of their fans. Even better, they responded to me and I responded back – that’s being social! If you have gone and liked other businesses in your community or industry, you are already (I hope) going to your business timeline feed and “liking” what they are doing and even commenting on their status updates. You should also be tagging them in status updates because Facebook has changed the algorithm, yet again, to get that post seen by more people, specifically, fans of the page you just tagged. These fans might not even know you exist, but you just tagged a business they “like”, they see it in their news feed and click on your page to see what you are all about. Remember, these are people who may have never even known you existed. They are taking time to see what you are saying, what content you are offering, etc. Imagine walking into a business, saying hello to that owner, having a conversation that all his/her clients over hear and now they MIGHT want your business. And you got that business FOR FREE. Of course, this kind of social activity takes time, or someone committed to strictly doing your social marketing on a daily basis. If you don’t have this kind of help, it might be time to start asking.